I just renewed my subscription to this awesome birding magazine. I read it word-for-word from cover-to-cover, including the advertising. 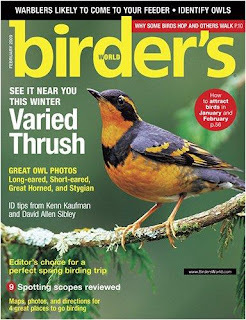 I like the Birder's World magazine because of its balance of articles about birding hotspots, identification tips, birding products, backyard birding info, and bird biology. I like that it focuses mostly on birding in the United States and does occasionally discuss some of the more exotic places. Articles support conservation, but not overbearingly so. In comparing this magazine to other birding publications, I really like that Birder's World is not too scientific. Often, birding publications come across as doctoral thesis dissertations. I just want to read a nice magazine about birds and birding and this is the best one I have found so far. They also have a great website with lots of free features and nice subscriber-only applications. Price: Approximately $26 annually if you get the special.